Warm up this winter with a bowl of ramen topped with crispy sesame tofu. Get the recipe below. If we’re really honest a bowl of ramen is just a bowl of noodle soup. But a bowl of soup can be a wondrous thing. It warms your heart, fills your belly and its a popular home remedy for when people are feeling unwell. With this in mind, it’s no surprise that my Japanese Chicken Noodle Soup is so popular. Since I posted that recipe, I’ve officially become vegetarian (after eating next to no meat for quite a few years) and for the last week I’ve been eating a vegan diet for Veganuary. I still love a big bowl of slippery noodles in a rich, umami broth so I decided to see if I could make a bowl of ramen which had tonnes of flavour, plenty of healthy veggies and a good slab or two of protein to keep me full. This recipe has it all! Follow the simple steps set out below and you too will be able to enjoy a steaming hot bowl of ramen topped with crispy sesame tofu. I’ve been making a couple of variations of this dish for quite some time and I often start with a packet of dried ramen noodles. You know the kind: they come dried in a block often with a packet of spices and some sesame oil. If you’re looking for a quick lunch or dinner they aren’t a bad place to start but I wanted this to be something a bit more special so I looked to the fancier dried noodles lurking in the back of my cupboard and so it’s a little bit cheeky that I’m calling this dish ramen but stick with me. It might not be the most authentic ramen recipe but it is delicious! Clearspring is my go to brand. I’m a big fan of their soba noodles but Jon loves the udon. Soba noodles are made with buckwheat and are a little thinner than udon. The udon are made with wheat flour and have a denser texture. Both work well in this recipe so pick your favourite. The key to the broth that the noodles are cooked in, is layering the aromatics. We start with miso paste, add some soy sauce, ginger and garlic before finishing with some fresh spring onions. We don’t want to cook the onions too long so that they retain their fresh flavour. The rest of the aromatics along with the water used to re-hydrate the dried mushrooms make for a really rich soup. It’s packed with umami, lifted by the watery crunch of the beansprouts and the bright flavours of the tenderstem broccoli and lightly wilted pak choi. To top the dish off, I’ve used a smoked tofu (Tofoo is my favourite brand) which has been shallow fried in sesame oil for a really nutty flavour. You might have noticed from the pictures that there’s something else green floating around in the bowl… That’s seaweed (or nori). You can get dried sheets in the supermarket (possibly in the snack aisle or with the ingredients for making sushi). It has a slightly fishy flavour and adds great texture when crumbled on top of the bowl. I know it sounds like there’s a lot going on with this dish but it really quite simple to make. 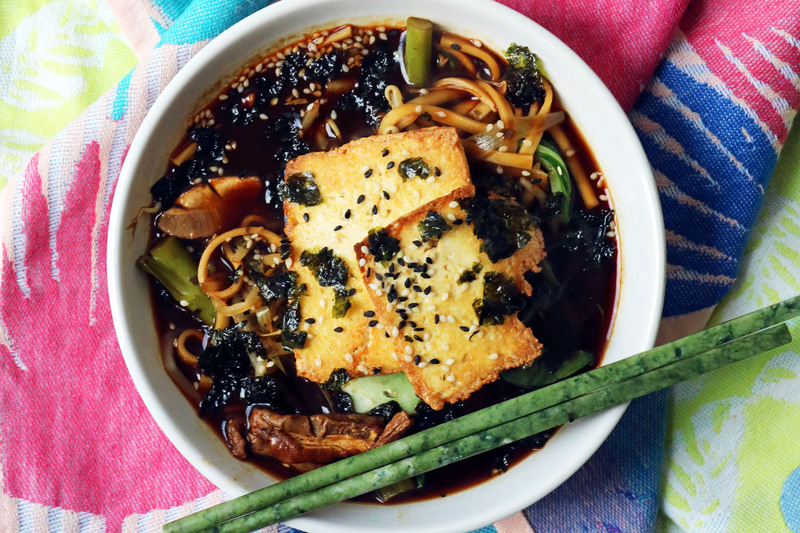 My favourite way to enjoy a this ramen is to slurp up most of the broth, then devour the noodles with big mouthfuls of crisp tofu, chewy porcini mushrooms, al-dente broccoli and slippery pak choi leaves. I then finish by tipping the bowl back and drinking the last of the liquor left at the bottom of the bowl. Delicious! Warm up this winter with a bowl of ramen topped with crispy sesame tofu. What's best is that it's entirely plant based and suitable for a vegetarian or vegan diet. Once they have re-hydrated, pour the liquid into a heavy bottomed sauce pan along with the miso paste, soy sauce, ginger and tenderstem broccoli spears. While the tenderstem broccoli cooks, cut the tofu into 4 slices. Dust each slice with a little bit of cornflour. Heat the sesame oil in a frying pan. Add the tofu to the sesame oil and cook on a high heat for 3-4 minutes until crispy. While the tofu is cooking add the noodles to the soup base along with the dried mushrooms and spring onions. Flip the tofu and cook for another 3-4 minutes until the second side is also crispy. Add the beansprouts and pak choi while the tofu finishes cooking. One all of the vegetables are wilted, the noodles are soft and the tofu is crispy you are ready to serve. Pour the noodle soup into two deep bowls. 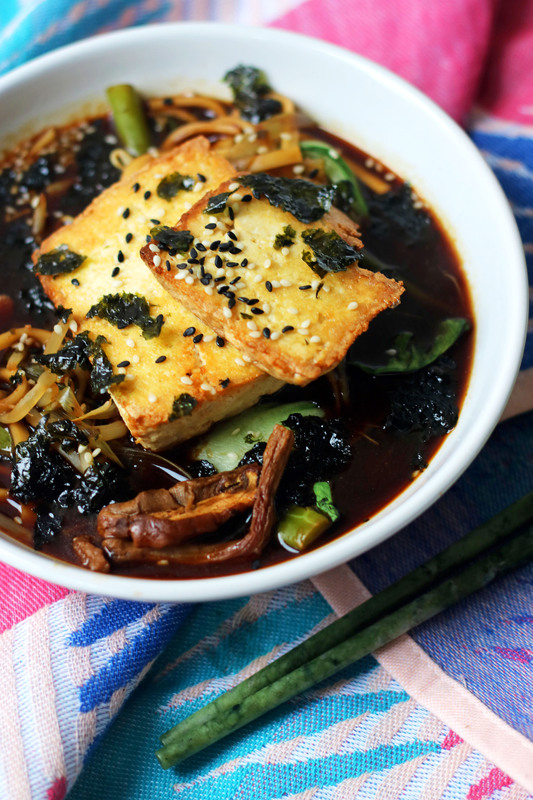 Add two slices of tofu to each bowl and top with the seaweed and sesame seeds. You will need at least 500-750ml for this recipe. If the porcini mushroom packet does not require this amount of liquid, top it up! Looks very comforting, like the idea of the crispy seaweed on top. I love all the flavors you have going on in this ramen! I definitely wouldn’t miss any meat! I also had no idea there was such a thing as smoked tofu! My son is obsessed with ramen every since we had it in New York and I have been trying to learn to make it. This looks likes it’s packed with flavor and I can’t wait for us to try it! This is a great recipe. It’s seriously satisfying and quite rich with flavor. The mushrooms really absorb all that deliciousness. Nice! I’ve been on such a ramen kick but I just assumed it would be too hard to make at home! But this recipe is perfect!